This weekend, Dog-o-War, Cannonball, and I got together to play a small scenario. Basically, a river, a town, an artifact that has to leave on the boat. 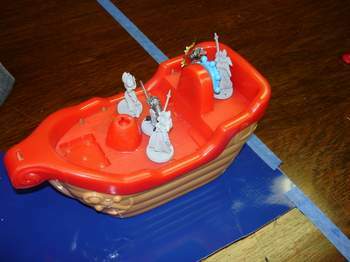 The objective was to be on the boat at the end of turn 9 when it leaves, the force that occupies the boat at that time wins, if units from more than 1 faction on the boat at the end of the turn, the boat leaves, and they fight it out, last man standing. The attack is on. Briefly, Devout and Firstborn charge, devout divides their forces and 2 elvish militia spring forth to cover each breach in the wall. 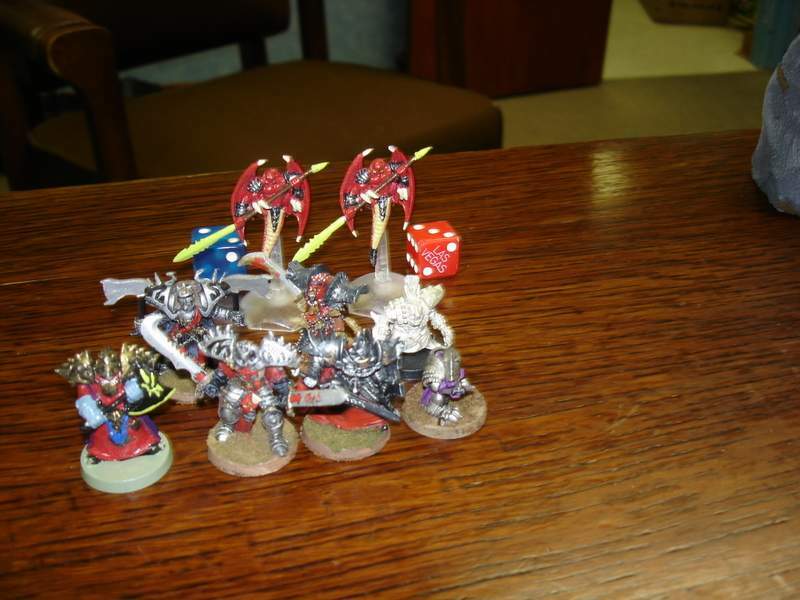 The Devout lead wiht some nasty undead, rendering my archer worthless, and he leaves the house to redeploy. The firstborn head for the far breach with the repulsar or sister in the lead, the militia retreat. The firstborn forge into the town, I dont beleive the milita do anything, they are cut down by the sister, who is then slain by the archer with an elvish arrow through the eye. The elves are now defending the dock with the archer in front of the dock, and the 2 dream warriors defending the dock itself, wiht the crystal knight behind. 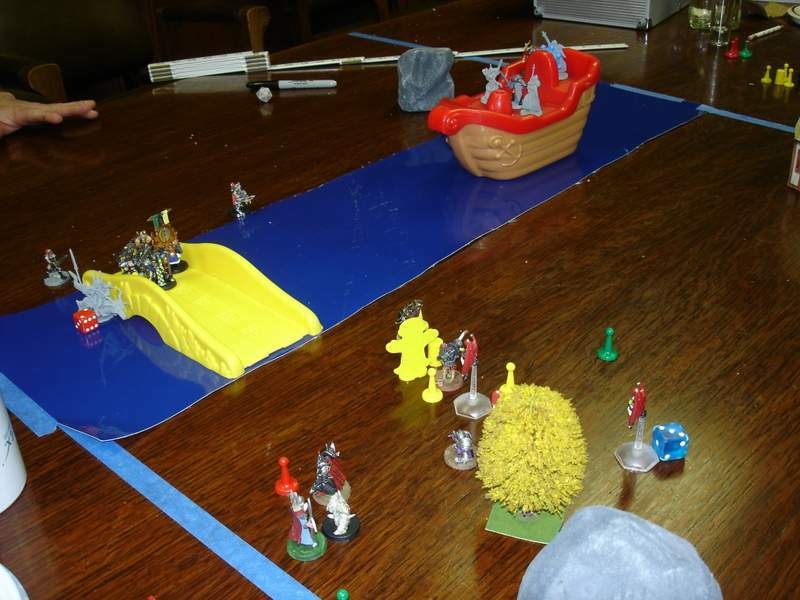 The archer is taken by the repulsar, then the repulsar swings into the devout backed by his swordsmen, as the elves retreat to the boat proper. it is now turn 5-6. The jackal clan scout manages to wound the repulsar, much to his anger, then i beleive the first born kill the rest of the devout, but the repulsar does not survive. That brings us to the next scenario played. Im hoping dog chimes in since he can recreate the battle better with the pics, but if he doesnt reply to this post and add the second scenario in a day or 2, ill do my best. fun was had by all, and the elves rejoiced mightily at the fall of the first born and devout. The 4-State Militia has been in to playing "Deathmatch" lately. I wanted to run a couple of scenarios to make it a little more "special-ops", which is how I see deathmatch. I wanted to tie them all together for a mini-campaign. I´ve been hanker´n to use a bridge and boat for a while and this gave me an oppurtunity to vent my creative juices. Hope you enjoy it. 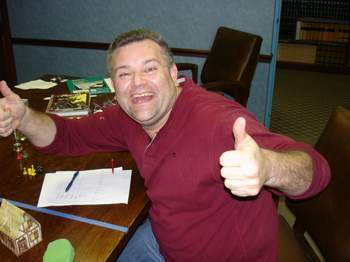 We played the 1st 2 parts of the campaign on feb. 24th. 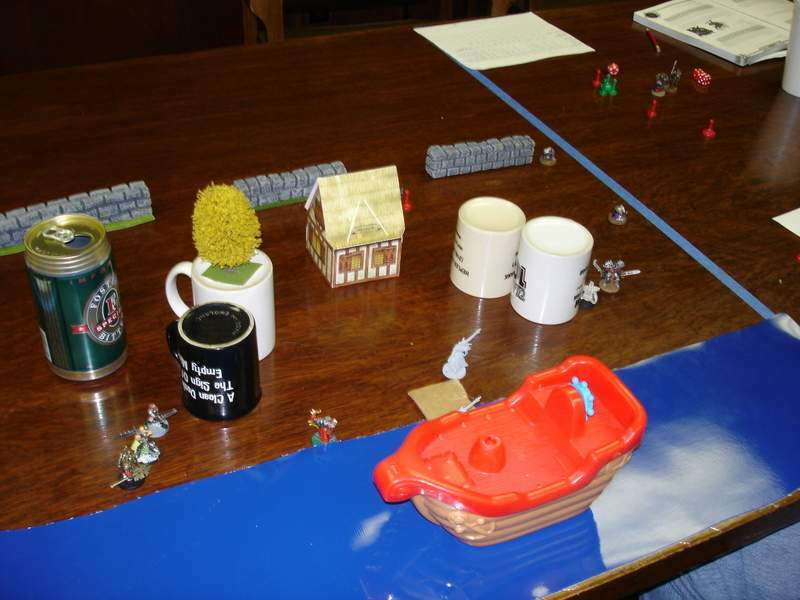 Setup- One side of the board is riverfront with boat, dock and 3 buildings to represent riverport. Defender (Troy) added wall sections. deployment would be around riverport for defender and opposite corners for the attackers. all forces got 250 pts, and only 1 individual which must be used in the 2nd scenario as well (he slain then he "survived his wounds"), this helped with continuity. 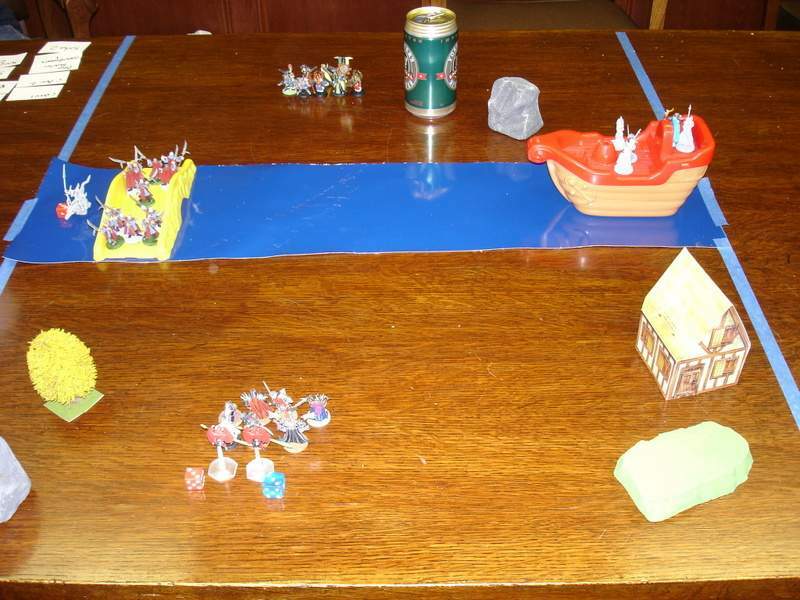 1) Defender could not retreat to boat till turn 5. 2) No model bigger than sz 2 on boat. 3) No flyer my land on boat. 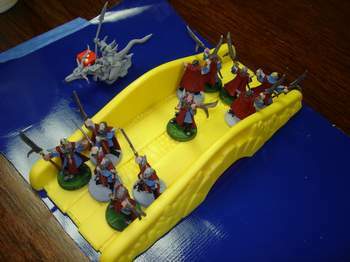 4) At the end of turn 9 the boat sails with whoever is on board, if more than 1 faction is present then "last man standing" rule applies. 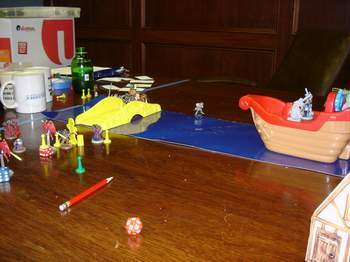 5) No more than 10 sz 2 (20 pts) woth of models may be on boat or 50% chanceof capsize every turn. I think this is turn 4 also. 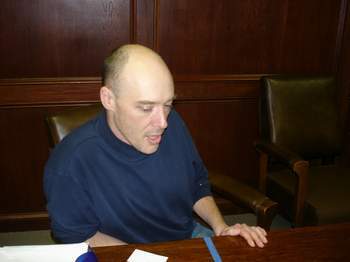 see Troy´s previous post for commentary. Whenever you try a new scenario you have concerns. I wondered if the defender would have a hard time of it. I did my best to make it a tight fight, and it seemed to work that way. I know Canonball had a hard time of it, he lost alot of his guys before getting around the buildings. Troy´s "National Guard" (Militia) performed like they were on PCP!!!! My devout did pretty well, I especially enjoyed 2 moments: 1) Lo-Ghun, my jackal clan scout, performed a vivisection ( killed him) on a Repulsar , man was canonball mad Grin; 2) A jackal crossbow pulling out his devout army knife and gutting a dream warrior, now that was sweet. In the end it was a jackal crossbow vs a crystal knight, with the end being predictable. Troy sailed away with the prize. This was a fun one to work on. Being a DM for 20+ yrs, I like designing intricate scenarios, I´m just weird that way I guess. It took me 2 weeks to work out the bugs on this one, but I was very satisfied. I wnated to create a scenario that would be hard to do with a "normal" game due to the restrictions, that would challenge all the players and involve alot of army planning and forethought. This was just too cool to see in action. River runs thru middle of board with a bridge about 3/4 quarters of the way down. 1 player holds the boat and the bridge and the others attack form opposite sides. The objective is to take/hold the boat anyway you can! The riverbank is level with the boat so jumping is possible otherwise take to bridge and drop aboard. Attackers get 450 pts apiece, defender gets 500. 1) Must use individual from last scenario. May take a 2nd indv. but not required. 2) Defender can have up to 5 modles (no more than 250 pts) on boat. must include Indiv. from last scenario. 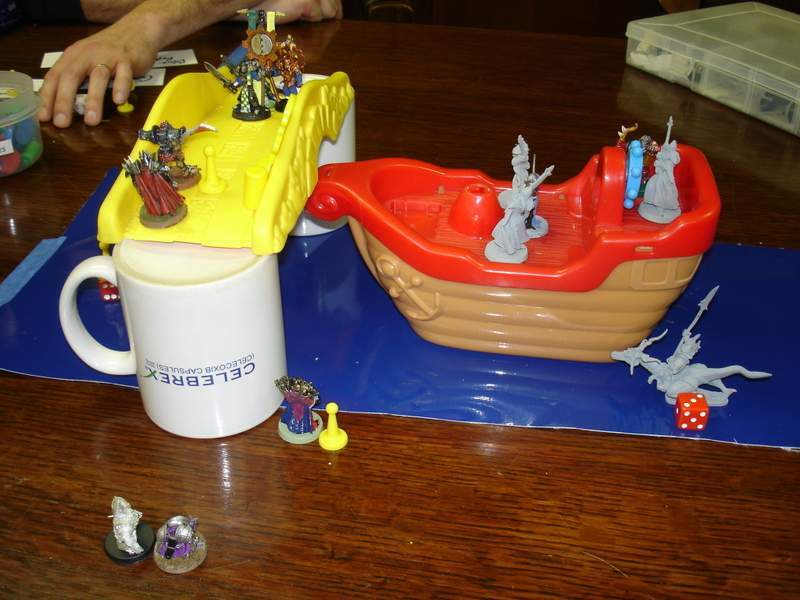 3) Previous rules form "boat" aplly form last scenario: Sz, capsize, flyers, etc. 4) Jumping form shore to boat requires a Ld test, if you fail you so swimming! Roll Ld again, if fail you drown, if succeed you spen 2 actions swimming to bank, 2 actions slimbing. 5) Jumping from bridge to boat is Ld +2, if fail you are prone on boat. You can hang off bridge(1 action) and then drop to boat (1 action) with no save. 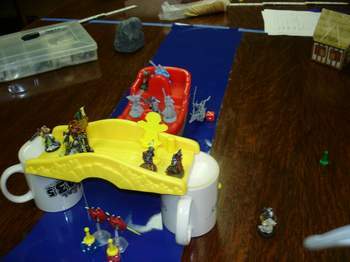 6)Defender cannot retreat units from bridge to boat unless has less than 5 models on board, and then only to max of 5. 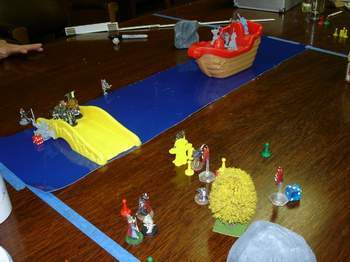 7) At the beginning of every turn the boat moves 4" down river (before initiative). Boat requires a mini to "man the helm". If at the beginning of turn there is no mini at helm the boat deviates up to 180 deg. Scuttling the boat is possible. This may only be attempted if Attacker/Defender has lost 1/2 of army. Model goes below deck and chops away. Boat has stats of reinforced timber : 22 AR, 4 WD, -2/0 DEF. 9) When boat moves off board, last man standing rule applies. 10) Anyone on boat is treated as having soft cover from shore. The game opened up with attackers going for bridge. The Devouts goal was to keep my force intact and get to bridge. I knew that Troy would deploy his "Stuka" (flying dragonbane), so I brought Demonwings to help out. 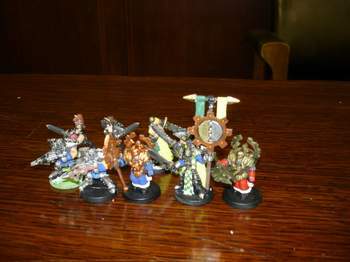 Once again I tried models I have not got to play to see how they do. I may stop doing that! I think I would have been better off with 1 more demon wing and alot of followers with a crossbow for support, oh well. The flying dragonbane was just amazing. It pretty much won the game for Troy. I don´t think it missed more than once or twice with javelins! It pummeled the FB unmercifuly, losing 2 black sisters in one turn. It also got a couple of wounds on a repulsar and killed my stalker with a charge/javelin. It could do no wrong. I managed to wound it with crossbow and a demonwing, but lost both DW in the process. 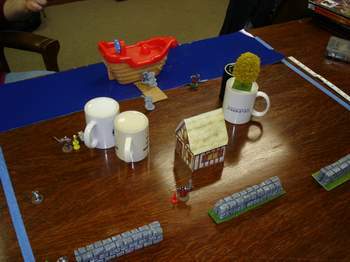 The attackers made it to the bridge and wiped out the defenders ( except the ..... Dragonebane!!). The FB were hurt´n so decided if you can´t get what you want, atleast kill what you can! Canonball´s last Repulsar charged across bridge (so much for the TRUCE), and slammed in to my devout, killing my JCS that was hanging form the bridge, before taking out a forgotten as well. My stalker came off hidden and cut down the repulsar, and was promptly lanced and javelined by the dragonbane, it was utter carnage! 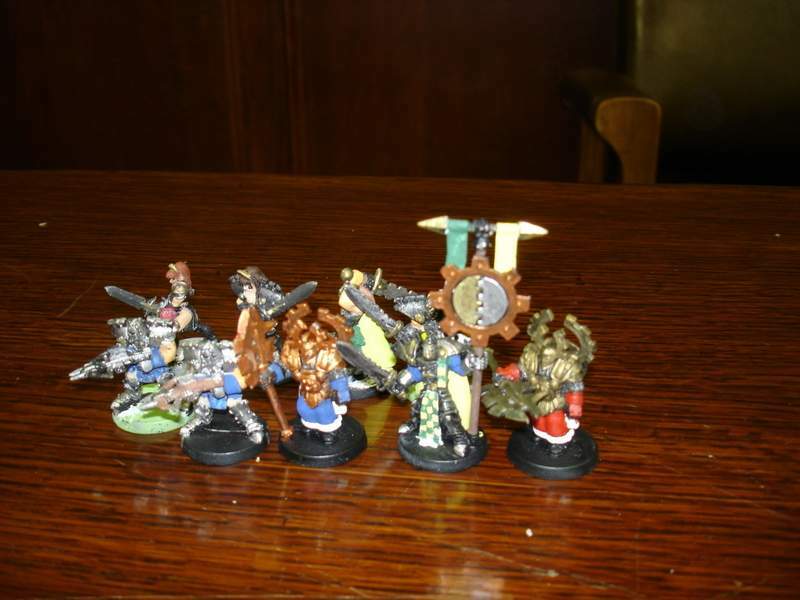 At the end the FB had a couple of models and the Devout had one lone Cursed to attack boat. Try as we might, we were cut down (damn frick´n dice). 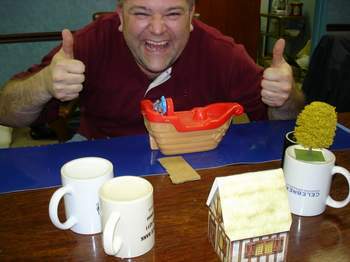 Troy sails away with the "Ancestreal Chamberpot of The Eldest Lotus-eater". All in all I was very pleased with how the scenarios turned out. I really enjoyed playing the 2nd one with all its cool options. I really want to play this one again. I had a BLAST!! !